Ironman Arizona saw fast times in the pro field this year with a new course record set by race winner Brent McMahon. 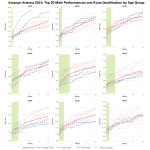 Fast as the pro race was I’m more interested in the age group performances and here we see a different story – overall age group times trended slower than usual for Ironman Arizona. It appears age groupers had a tougher day of it than the pros. Starting with the median splits, we can see that at the professional level bike and run were faster in this years race than in previous years. 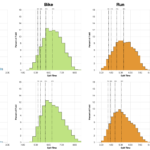 We can also see that while this is true for the pros, in the age group ranks median swim, bike and run times tend to be slower. 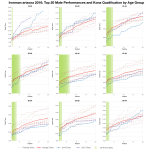 It’s not unusual to see divergence in pro and age group results, it’s perhaps a little more unusual to see those differences so clearly demarcated. Of course we see this slower pattern in the split distributions too – this years race distributions are clearly slower across all 3 disciplines. Each discipline is clearly weighted towards the right hand side and this accumulates into an overall distribution with a heavy, slow tail. Estimating the DNF rate at this year’s race also suggests it was slightly higher than usual for Arizona. Conditions may well have been slower this year and they may also have become tougher as the day went on (meaning less impact on the fastest athletes). 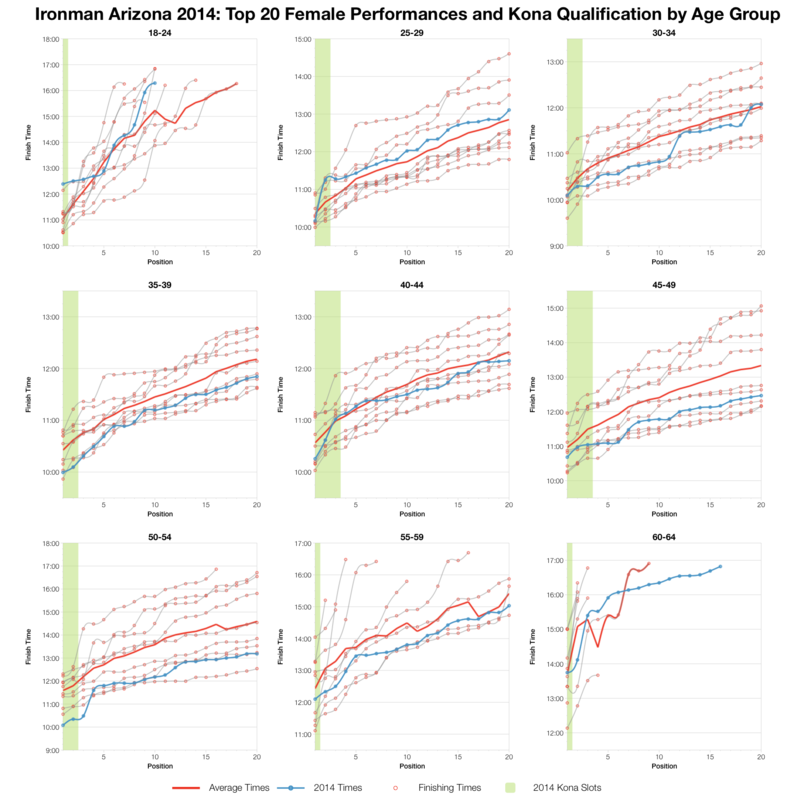 Ironman Arizona 2014 had a particularly large field with 3,200 athletes listed in the tracker, it’s possible this growth in numbers comes at the slower end of the field while the number of fast age groupers remains largely constant. 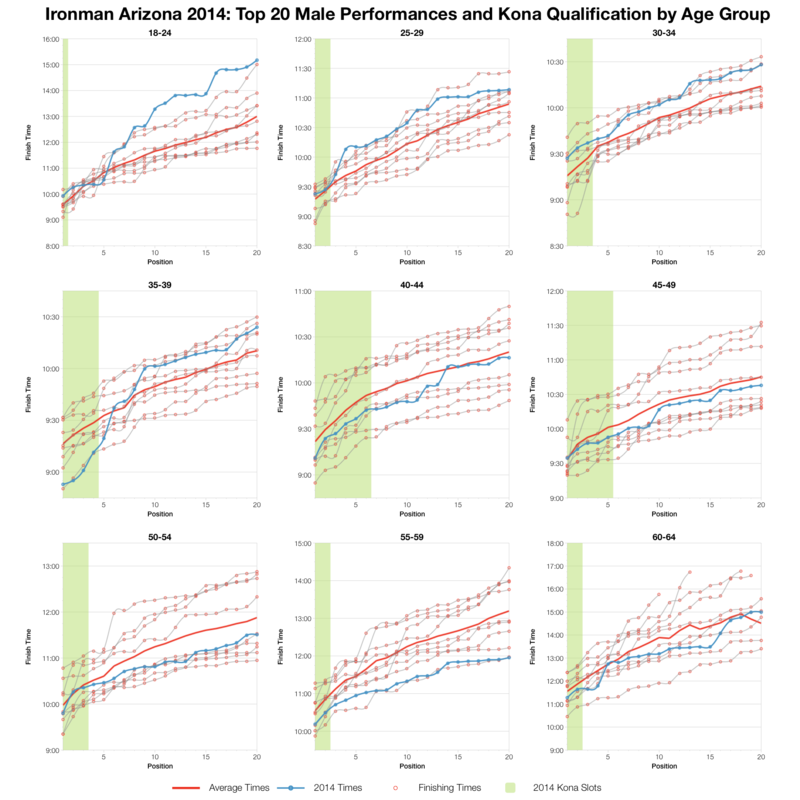 Other races have hinted towards this trend with slower split distributions, but faster performances at the front of the age group race. We definitely have the former. At the front of the age group race, amongst the top twenty in each age group, trends are not that clear. I think it’s reasonable to say that in the women’s field top times generally appear to have been average or better for the race, certainly not slowed in the way the medians were. For the men it seems the older the age group the better they performed relative to race averages. Not a clear sign of a split in the age group field between those at the front of the race and the majority of race entrants. 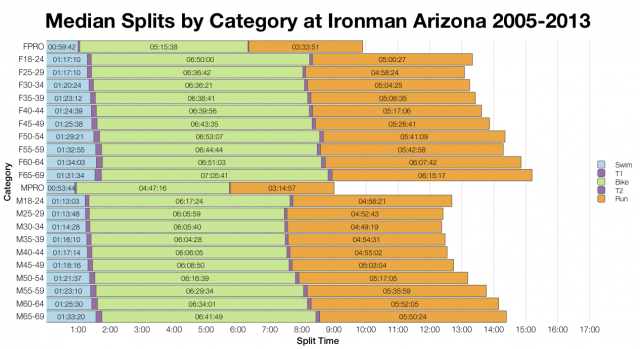 What can be said is the pro field performed well on the day and the front of pack age groupers broadly performed on par with previous races (with a few exceptions on either side). The bulk of the age group field however came out a little slower than the race averages and this was spread over all three disciplines of the race. 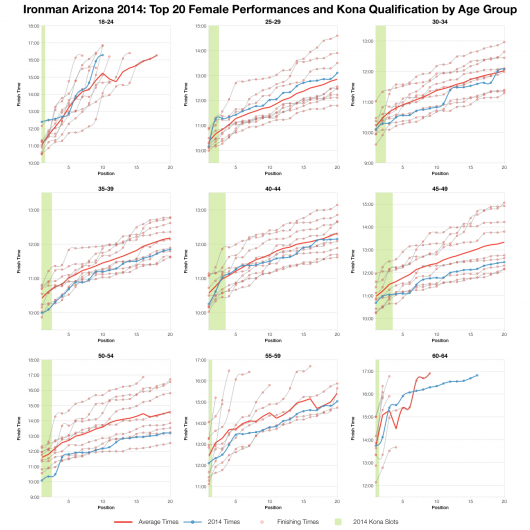 Finally from a Kona qualification perspective the race was certainly as competitive as previous years. A spreadsheet of the full results and splits from Ironman Arizona 2014 is available on my Google Drive.